Sometimes life lessons are so important you have to learn them several times before they really sink in. This weekend illustrated exactly that point. In the midst of enjoying some beautiful Bank Holiday weekend weather, Claire and I discussed the fact that it would be nice that evening to sit outside around a fire pit. Knowing that so many shops offer this type of thing at apparently cheap prices we set off for a couple of hours in the car, calling at various DIY stores and household goods shops. They all had something that looked a bit like what we had in mind, but nothing that was quite right. In the end we gave up and came home, discussing on the way back that all we really wanted was a steel dish shaped thing and surely there must be a simple solution to this. There was. 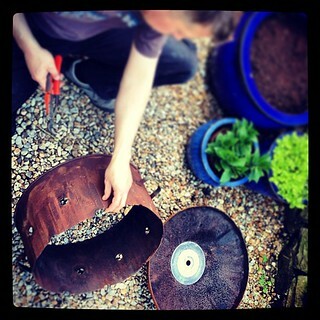 In fact it was already rusting quietly in the garden awaiting it’s inevitable fate. A bit of speedy work with some tin snips and pliers saw this broken incinerator converted to a rustic looking fire bowl in about 15 minutes. A worn out diamond saw blade nicely filled the hole in the bottom, leaving a small air gap in the centre. Now I accept that this is more ‘Steptoe’s yard’ than ‘Urban chic’, but I quite like the rough around the edges vibe. Interestingly, the central hole created a great air flow through the fire bowl as it was able to draw in through the holes around the sides. Recycling a previously abandoned item – 10 points. Making something yourself rather than buying it – 5 points. Creating a more or less instant solution – 10 points. Achieving something for zero cost – 20 points. 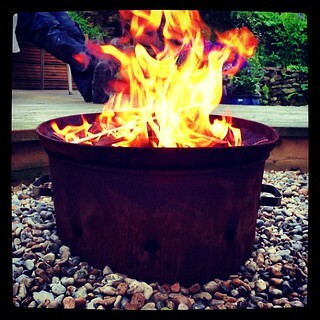 Spending a great evening sat by the fire drinking Champagne and toasting marshmallows – 100 points. I reckon that makes me the winner this weekend. 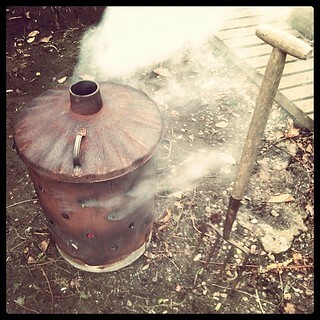 I don’t feel so bad about me and George burning the bejeezus out of the incinerator now it has a new lease of life. 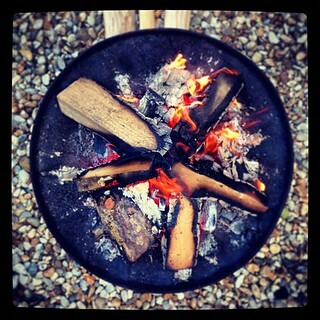 It certainly works better as a firebowl than a bottomless holey bin. I would give you a lot more points than that–touche (as in the fencing term). How did it feel to hang out by the heat that evening, priceless right? It was ace…but I must admit my hair smelled smokey…even after I washed it!